made to serve as an “interferential refractor,” and has the two important advantages of small cost, and wide separation of the two pencils. The apparatus as above described was constructed by Schmidt and Haensch of Berlin. It was placed on a stone pier in the Physical Institute, Berlin. The first observation showed, however, that owing to the extreme sensitiveness of the instrument to vibrations, the work could not be carried on during the day. The experiment was next tried at night. When the mirrors were placed half-way on the arms the fringes were visible, but their position could not be measured till after twelve o’clock, and then only at intervals. When the mirrors were moved out to the ends of the arms, the fringes were only occasionally visible. to the Astrophysicalisches Observatorium in Potsdam. Even here the ordinary stone piers did not suffice, and the apparatus was again transferred, this time to a cellar whose circular walls formed the foundation for the pier of the equatorial. Here, the fringes under ordinary circumstances were sufficiently quiet to measure, but so extraordinarily sensitive' was the instrument that the stamping of the pavement, about 100 meters from the observatory, made the fringes disappear entirely! If this was the case with the instrument constructed with a view to avoid sensitiveness, what may we not expect from one made as sensitive as possible! equator; hence we may say the resultant would lie within 25° of the. equator. The nearer the two components are in magnitude to each other, the more nearly would their resultant coincide with the plane of the equator. or 0*16 of the distance between the fringes. If, on the other hand, th-e proper motion of the sun is small compared to the earth’s motion, the displacement should be of *08 or OO^S. Taking the mean of these two numbers as the most probable, we may say tha£J:the displacement to be looked for is not far from one-tenth the distance between the fringes. The principal difficulty which was to be feared in making these experiments, was that arising from changes of temperature of the two arms of the instrument. These being of brass whose coefficient of expansion is 0*000019 and having a length of about 1000 mm. 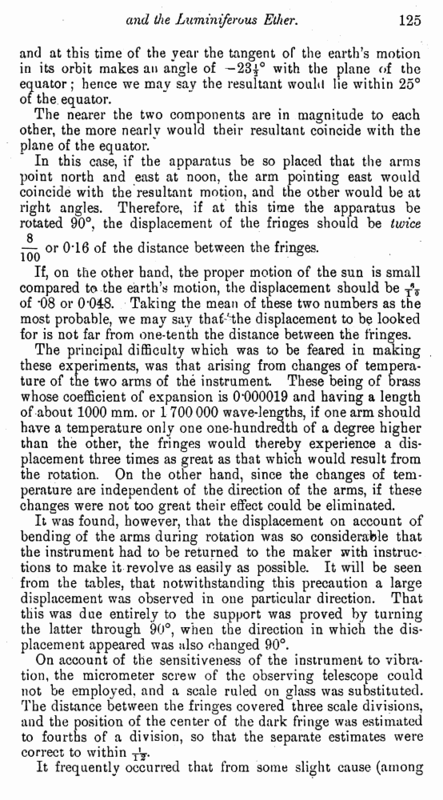 or 1 '700 000 wave-lengths, if one arm should have a temperature only one one-hundredth of a degree higher than the other, the fringes would thereby experience a displacement three times as great as that which would result from the rotation. On the other hand, since the changes of temperature are independent of the direction of the arms, if these changes were not too great their effect could be eliminated. It was found, however, that the displacement on account of bending of the arms during rotation was so considerable that the instrument had to be returned to the maker with instructions to make it revolve as easily as possible. It will be seen from the tables, that notwithstanding this precaution a large displacement was observed in one particular direction. That this was due entirely to the support was proved by turning the latter through 90°, when the direction in which the displacement appeared was also changed 90°. 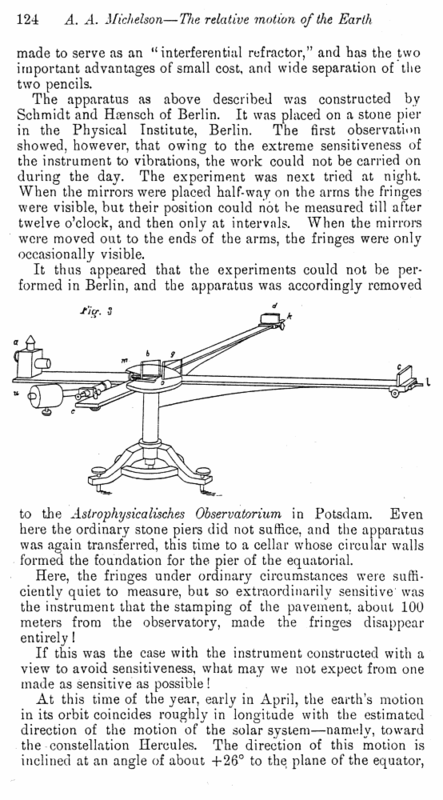 On account of the sensitiveness of the instrument to vibration, the micrometer screw of the observing telescope could not be employed, and a scale ruled on glass was substituted. The distance between the fringes covered three scale divisions, and the position of the center of the dark fringe was estimated to fourths of a division, so that the separate estimates were correct to within T'-%.